Over 25 years later, The Forgotten Temple of Tharizdun still creeps me out. I'm not entirely sure why, but I suspect, even moreso than its quasi-Lovecraftian theme -- a dark, imprisoned god -- it's the artwork that does it for me. The module is entirely illustrated by an artist otherwise unknown to me, Karen Nelson. This level of artistic unity was unusual in TSR modules, which tended to use several artists. Here, though, the consistent look contributes greatly to the feel of the thing. I find the cover image perfect: its unisex, featureless humanoid surrounded by writhing tentacles/serpents/arms being a superb evocation of the kind of "unfocused" uneasiness I feel about the module. I say "unfocused" because, as I said, I can't quite put my finger on why module WG4 makes me feel so unsettled. Simply reading the text itself, there's really nothing truly disturbing there. There are no images of graphic violence or even of psychological disturbance. 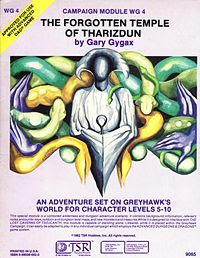 Indeed, on many levels, The Forgotten Temple of Tharizdun is merely a workmanlike Gygaxian dungeon crawl. But I think it's probably a mistake to look for any one thing as the source of the module's strange feel. I think what sets it apart is that cumulative effect of many little details. I've already noted the artwork, which I found to be (largely) atmospheric. The color of the module itself -- a sickly lavender -- is unique among TSR modules of the day. Tharizdun's colors are black and purple, if I recall, and these hues appear throughout the module itself. Now, black as an "evil" color is somewhat cliched, so much so that it doesn't really have any effect upon me anymore. But purple? Purple is a royal color and second only after pink in the hearts of little girls. How could purple be "evil?" Take a look at the cover of WG4 and you can see. It's a sickly shade -- the color of decay, entropy, and insanity. The module is a quasi-sequel to The Lost Caverns of Tsojcanth, another excellent Gygaxian dungeoncrawl and one with a similar theme: exploring the former haunt of an ancient evil. Whereas "ancient" in the case of Tsojcanth means several centuries before the present, WG4 takes it to mean millennia beforehand. There's a creepiness that comes from thinking about an evil from the time before time. I think that's another part of what makes this module work for me: Tharizdun the imprisoned god may seem like a Lovecraftian concept -- and it is -- but Gygax didn't share HPL's worldview. He was, as I've said elsewhere, a pretty traditional fellow when it came to moral matters and so Tharizdun, while ancient and thus unspeakably evil is nevertheless evil. That is to say, he's genuinely malevolent; Tharizdun actively wishes to bring ruin upon the entirety of the multiverse. He isn't beyond good and evil -- he is Evil. Then there are the gnomes. No, I don't find gnomes disturbing, but I do find the use of the gnomes as the framing device for the module to contribute to WG4's creepiness. See, Gygaxian gnomes have more in common with garden gnomes than with the post-Dragonlance mess we call "gnomes" nowadays. They're these unassuming woodland guys who hang out with badgers and moles and are renowned for their trickster natures. Take that image and juxtapose it against an ancient temple dedicated to an avatar of Ultimate Evil and you have to admit that it's jarring. Equally jarring are all the Fiend Folio monsters that make their appearance here. Gygax is known to have disliked the FF and I don't blame him; it's a much more uneven work than his own Monster Manual and even its best monsters can only be called "quirky." And yet here they are in WG4, probably the only time, say, norkers ever appeared in my campaign. This gives the whole thing an "otherworldly" feel to me, as if it takes place somewhere other than the typical Gygaxian World of Greyhawk. I can't say, as some might, that The Forgotten Temple of Tharizdun is a good module for its actual content. I don't dislike it, mind you, but I also don't think it's all that remarkable. What is remarkable, though, is the feelings it still conjures up in me after all these years. It's a very effective mood piece and one I'd love to be able to emulate some day in my own work. Good points re: the printing colors. I could never quite put my finger on what weirded me out about WG4, and you did it for me - especially as compared to the rich color palette represented by other module covers around that time period. Karen Nelson is the mother of Eric Nelson Shook, who was (and still is, for that matter) a friend of Rob Kuntz and player in the Greyhawk campaign. They lived in Lake Geneva and she was, from what I gather, something of a local "character." I never much liked this module BITD -- I thought the canned intro with the gnomes was cheesy (and a portent of things to come with the even cheesier canned intro to WG6), I didn't like that the wilderness map was drawn at a different scale and in a different style than the S4 map, making it harder to merge the two together seamlessly, and I didn't like all the Fiend Folio monsters which felt tacked on in blatantly commercial manner (sort of like using all the new UA character classes in the D&D cartoon) -- we know that all these FF monsters weren't there when Gary ran this dungeon in campaign-play in the 70s. I re-read the module recently and, while I still don't like all of those elements, there's enough other good stuff to shift my opinion back towards the positive. One thing I particularly like is that the humanoids aren't the original inhabitants of the dungeon, and are just as much intruders there (and just as ignorant of its origins and deeper mysteries) as the PCs. I also like the "living dungeon" element of how the humanoids react to invasion and how the dungeon will be different if the PCs fight a pitched battle, leave, and return later -- this is, IMO, a good example for other DMs to follow; not necessarily to write it all out the way Gary did, but to have it in mind. The fact that there are essentially two dungeons in one layered atop one another -- the "text" of the humanoids, and the creepy subtext of the temple itself -- strikes me as brilliant design. An uninquisitive party could conceivably "win" this module (by killing off all the humanoids) and have no clue about the actual purpose or secrets of the temple, and the module is totally okay with that -- there's no railroad (except perhaps for the DM thinking it's cool and wanting to use it) forcing the players to explore the whole thing, only their own curiosity and sense that "something's weird here." "An uninquisitive party could conceivably "win" this module (by killing off all the humanoids) and have no clue about the actual purpose or secrets of the temple, and the module is totally okay with that"
That's exactly what happened the one time I ran this module. Piggy-backing on Trent's post, Tharizdun should stand out as pretty distinct from Gygax's usual approach to D&D, since he borrowed the god from Kuntz's Kalibruhn campaign. See Kuntz's "History of Tharizdun" on Canonfire! at http://www.canonfire.com/cfhtml/modules.php?name=Downloads&d_op=getit&lid=92 for details. Also worthy of note is that WG4 was a slap-in-the-face to the TSR production department at the time it was produced, since they took months to get modules ready for publication. Gygax wrote the module, Karen drew the art, and Eric the maps and IIRC also laid it out. All within a month. Good post. I still get shivers when I hear the name of the module -- or see its cover. Never played it through, though. The first thing I think of with WG4 is the Undertemple that is almost entirely impossible to find. No clues, no riddly poem to lead you there. There's something meta-disturbing that someone wrote a big portion of a module intending it to be sort-of thrown away. On a structural level, I find that really creepy in a 4th-wall kind of way. My major issue with this module was that when I read it I thought "Oh, that's a rip-off of Ksarul from Empire of the Petal Throne". Still do. That left me with a highly negative view of the whole thing which was not boosted by anything else inside it. It seemed overly dependant on blind luck. There seemed no really good reason why a party would be there or ask the right questions to find the temple. I'd have to read it again, but those were my feelings and after we ran it I think the whole party felt that it was a bit of a waste of time, even though they finished it pretty comprehensively. That's interesting, Allan, about WG4 being a slap in the face to TSR's production department. Norkers even make an appearance in one of the new 4E modules - H2: Thunderspire Labyrinth. I had a total blast playing this module. How connected it is to S4 and what one does with the surrounding gnomes are totally campaign-dependent calls, I'd say, as are most intro-type text sections in TSR modules. The storming of the humanoids can be an epic, hours-long masterwork of a set piece. Gygax did a great, strategy-gamer-quality job in setting up the waves of monsters and their possible reactions. My players ended up in a bug hunt for the survivors, which is where all the extra creepiness began to set in. Though in our campaign, they had been sent there both to recruit the gnomes and to find some items of power (you know the ones) to help in the wars against the giants, as they played this between G2 and G3. I think the module is a bit less than it could be for various reasons - there is an odd disjointedness in it that does not quite work for me - but there is also something that is missing from a lot of modules: subtlety. In gaming, there is a tendency to portray evil in a straightforward and naturalistic way, and Tharizdun is not like that. The temple is less a repository of horrific things and more of a place that tells you, through several small cues, "You don't belong here." This restrained inhuman quality is what makes it stand out, and this is, unfortunately, what is missing from products created after Tharizdun had become fashionable to use, since the authors got all the details and "Greyhawk lore" but none of the motivating spirit. Thanks to Trent and Allan for their insights here. This is great information that I'd genuinely never read before. Very useful! As I recall, Gary didn’t say that he didn’t like the Fiend Folio. He was just annoyed that his list of which monsters to leave out didn’t get followed. You may well be correct. I just remember Gary speaking somewhat ill of FF, which suited me fine, since I never much liked it. One of the "little things" about this module that I didn't see mentioned is its designation code: WG4. It is indeed a small detail, and possibly unimportant, but when this thing came out, my friends and I wondered where WG1-3 were. This module seemed to just come out of nowhere, like Tharizdun itself, as something that didn't belong. I will echo the general sentiment of creepiness engendered by this module. Could just be that adventuring in the tomb of a dead nightmare god is just unsettling. I agree that the FF monsters help to make this feel like fanfic. Funny. I thought I was alone in being unnerved by this adventure.